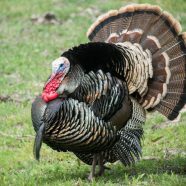 Certified wildlife biologist Bob Erikesen will discuss the natural history and ecology as well as behavior of the wild turkey, touch on research and management of the species and talk about hunting techniques. Bob has worked on research and management of wild turkeys, black bears and other species for 45 years and worked for 29 years as a biologist with the New Jersey Division of Fish and Wildlife and the Virginia Game Department. He served more than 14 years as a biologist with the National Wild Turkey Federation retiring in 2015. Since then Bob has worked part time as a wildlife consultant and writer. He has a masters’ degree in wildlife management from Rutgers University. Bob and his wife Sue live in northwestern New Jersey and have six grown children. He is an avid hunter and photographer.